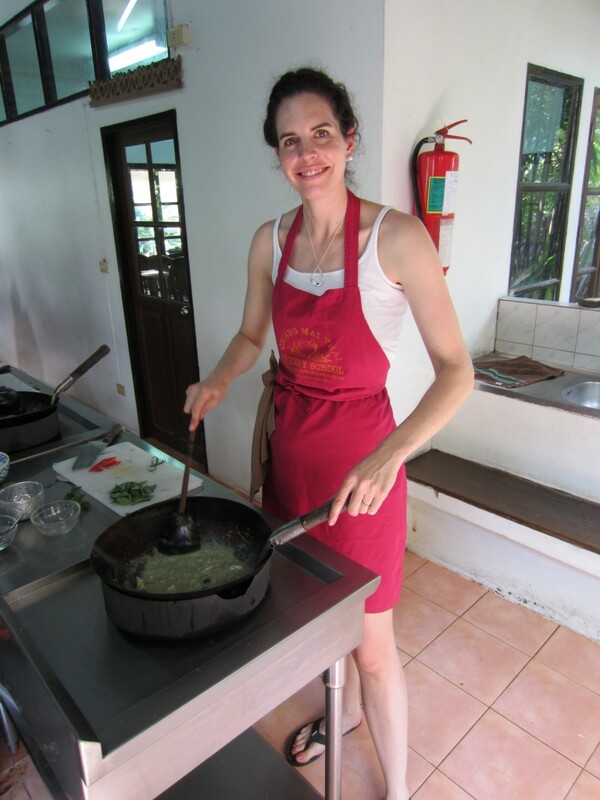 When we went to Thailand a couple of weeks ago, one of the things Mr. Spring and I did was an all day cooking class in Chiang Mai. 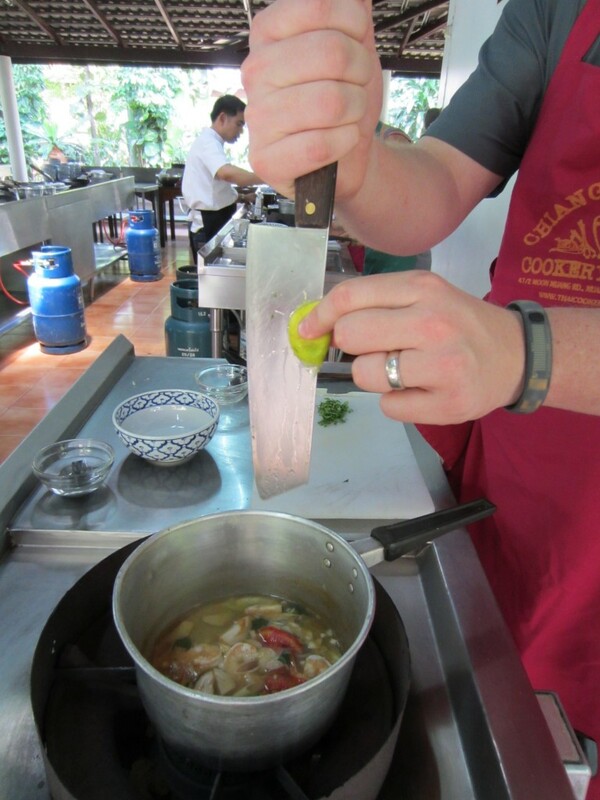 If you ever go, we definitely recommend the Chiang Mai Thai Cookery School. There was excellent instruction, and it was very hands on as each person prepared his/her own dishes. Plus, there was lots of yummy food to eat. I thought it would be fun to share some of the recipes and techniques we did. 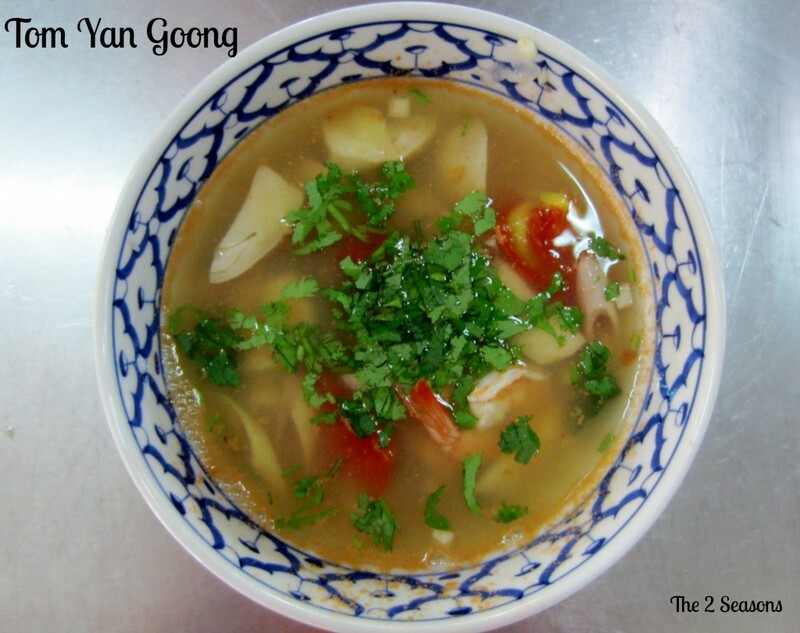 Today I am going to give you the recipe for Tom Yam Goong soup which is a Thai hot and sour prawn soup, and it is so good. 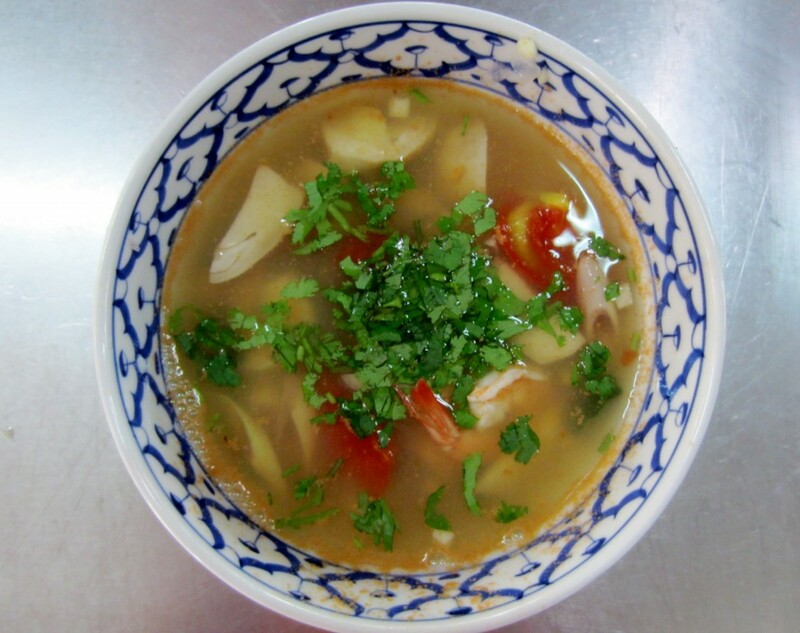 This soup was made with prawns, but also it can be made with chicken, depending on what you like. We made a broth version, but a lot of people know this soup with a coconut base broth. You add a little amount of coconut milk and stir at the very end to have the creamier coconut broth. Both ways are very tasty. With each dish we went to a classroom and watched the chef prepare and cook the dish first. Afterwards, we each came to our own cooking station and went to work. While everything was set out for us, we had to chop and do some other preparations. We learned it is best to have everything prepared and ready. The spoon at the top of the picture was made out of a coconut shell. I loved it, and we looked everywhere for one and didn’t have any luck. I guess maybe a Thai restaurant supply store might have them. Here you can get a view of things cooking in the pot and smelling amazing. Ahh… I wish you could have smelled how good this was. Towards the end, we added some lime, and this was a good little tip they taught us. Hold your knife sideways and squeeze the lime down the non-sharp side. This way you will get lots of juice. 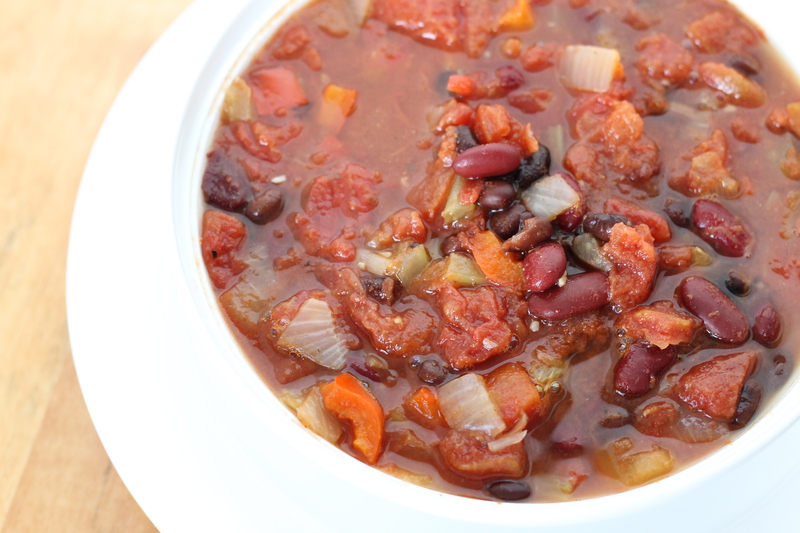 See below for the recipe and enjoy. 2 cups, prawns-washed, peeled and deveined. Keep the peelings. 2 stalks of lemongrass- lower 1/3 only, slice into (1 inch) pieces. 20 small green chillies (this is where you can add spice) If you do not want spice add whole. If you want some spice, cut in 1/2 lengthwise and remove seeds. If you want it very, very, very, spicey, cut in 1/2 lengthwise and keep seeds. Put the heads and peelings of the prawns in a pan with the water and bring to a boil. 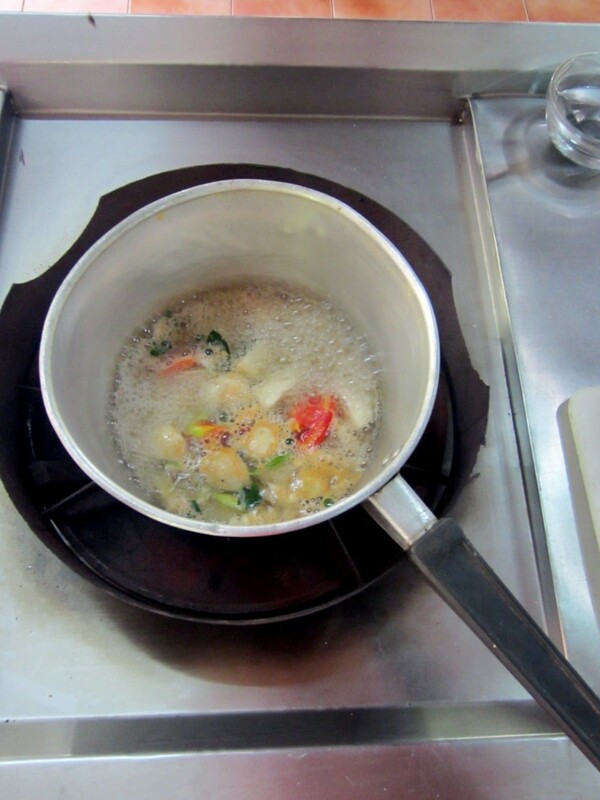 Remove the prawns and peelings from the pan and bring the stock back to a boil. Add the garlic, shallots, lemongrass and ginza, and bring to a boil. Then, add the mushrooms and tomatoes, and bring back to a boil. 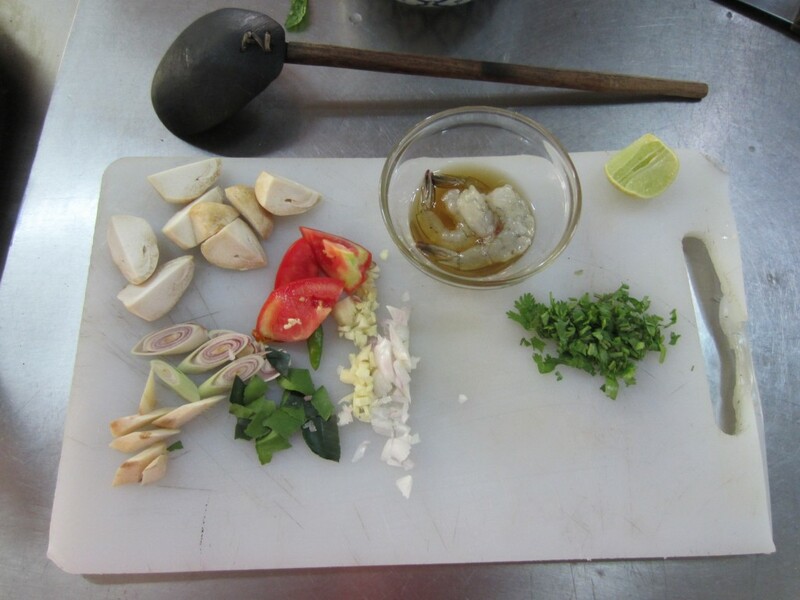 Add the chillies and fish sauce followed by the kaffir lime leaves. Cook gently for 2 minutes, then add the prawns and cook for about 20 seconds till they turn pink. Turn off the heat, and stir in the lime juice. 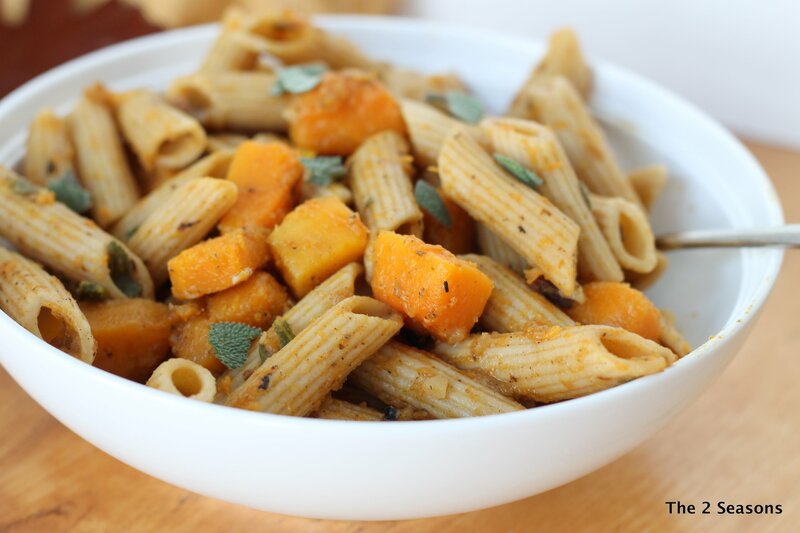 Serve garnished with the cilantro. This looks so fabulously delicious and healthy too! I gave the recipe to my Mister who is the cook in the family and said he should make a big pot of it. After seeing the recipe he said he would when our #2 comes home this week. Yum… can’t wait! This looks wonderful. Such a fun class to take! Oh what a fun thing to get to do! This soup looks really delicious.